Amanda Jackson Band: AJB & Friends Featuring Nick Doneff - June 4th! 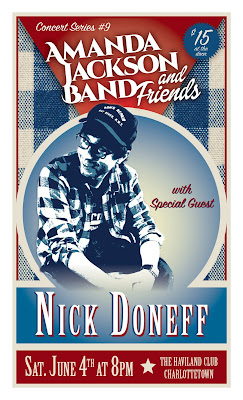 AJB & Friends Featuring Nick Doneff - June 4th! The 9th installment of the AJB & Friends Concert Series brings the very talented young, singer-songwriter, Nick Doneff, to The Haviland Club stage! Since relocating to Charlottetown from Ontario in 2013, Nick has become an active member of the Island's music community as a sideman for artists such as Nudie, Liam Corcoran, and Meaghan Blanchard. Nick has also begun emerging under his own name with a growing catalogue of original songs that pull audiences in with a quirky brand of sincerity and the relatability of a true old-soul. For those unfamiliar with the format, Nick will start the night out with his set and we will join him on a couple of songs of his choice. After a break, we'll hit the stage with a full set and then Nick will join us for a couple of our song choices! Admission is $15.00 (cash only) at the door and we will begin accepting payments no later than 7:30pm. You will be provided a number for seating order but there are no assigned seats (first come-first serve). Please feel free to come earlier to enjoy a drink and social time! Doors will be open for seating by 7:45pm with show starting at 8:00pm!